How do you maintain cocktail creativity despite the winter blues? "I wanted to build a refreshing tequila cocktail. 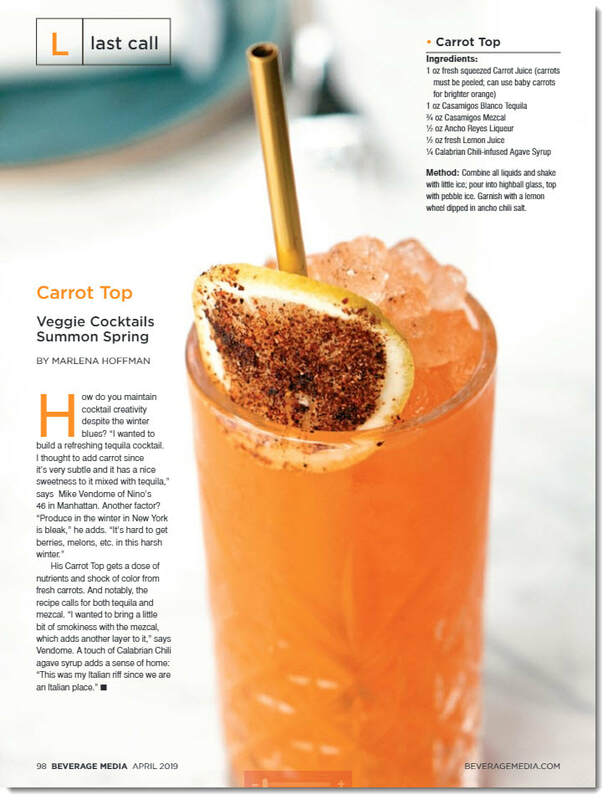 I thought to add carrot since it's subtle and it has a nice sweetness to it mixed with tequila,"says Mike Vendome of Nino's 46 in Manhattan. Another factor? "Produce in the winter in New York is bleak", he adds. "It's hard to get berries, melons, etc. in this harsh winter." His Carrot Top gets a dose of nutrients and shock color from fresh carrots. And notably, the recipe calls for both tequila and mezcal. "I wanted to bring a little bit of smokiness with the mezcal, which adds another layer to it," says Vendome. A touch of Calabrian Chili agave syrup adds a sense of home: "This was my Italian riff since we are an Italian place." Astoria’s Greek dining scene is massive, but it’s a family-owned and -operated Italian spot that’s currently the talk of the neighborhood. Buzz has been surrounding Ninos AQ ever since brothers (and Astoria natives) Michael and Franco Vendome announced the project last summer. The excitement has only amplified since its December opening, with a constantly packed dining room and glowing reviews across social media. Thankfully, the trattoria has lived up to the hype on the excellence of its ravioli alone. But there are plenty more reasons to eat here right now. Read on, and buon appetito! ​Over on the Astoria Post they recently reported the impending arrival of Nino’s AQ, an Italian restaurant brought to you by Michael and Franco Vendome, two brothers behind Midtown modern Italian joint, Nino’s 46. Italian food is no stranger to Astoria—there’s nearby L’Incontro is one of the neighborhood’s more well-known restaurants, as well as Vite Vinosteria, Via Vai, and Vesta (so many Vs), not to mention the numerous Sicilian bakeries and Italian salumerias. But what really caught our eye is Nino’s AQ’s offering of gluten-free options, a dietary landscape that has gotten more attention and care these days. Two Astoria natives are opening a restaurant with a contemporary take on traditional Italian food. Brothers Michael, 30, and Franco Vendome, 39, will open Nino’s AQ at the intersection of 35th Street and Ditmars Boulevard–where Mussels N’ Sausages was located– this June or July. The restaurant will offer fresh takes on traditional Italian specialties, including wood fired pizza, homemade pasta and ample healthy and gluten-free options. ​NINO’S AQ IS GOING TO OPEN ANY MINUTE!